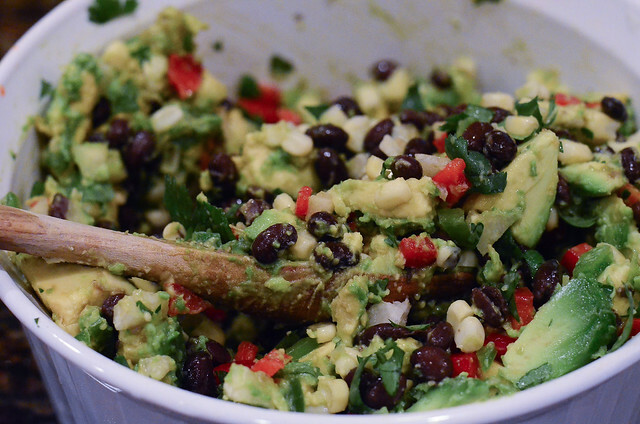 This Fully Loaded Guacamole takes guacamole to a new level! 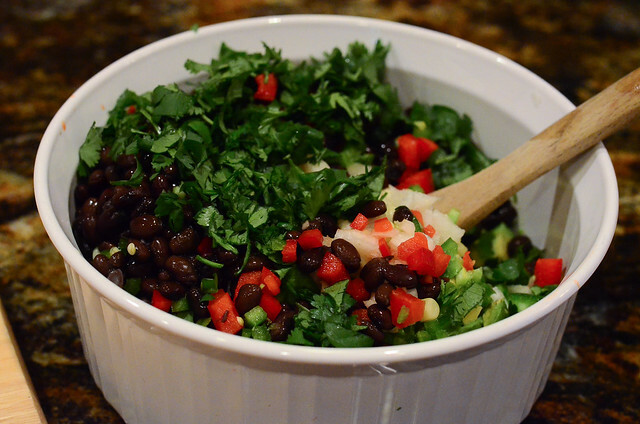 Avocados combined with black beans, jicama, corn, bell pepper, jalapeno, cilantro and lime. 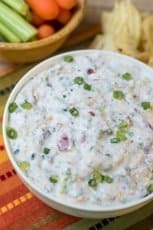 Tons of flavor and texture in every bite! I’ve made a whole lotta guacamole in my life. I’ve played around with ingredients, adding one thing or another, just to make things interesting. Then I had the wild idea to add everything under the sun, all at once. It was a good idea. I was inspired by the White Corn Guacamole at California Pizza Kitchen. It’s on their small plates menu and it is delicious. The only problem is the “small” part; you only get about 1/2 cup. This just won’t do at my house. I had to think bigger. 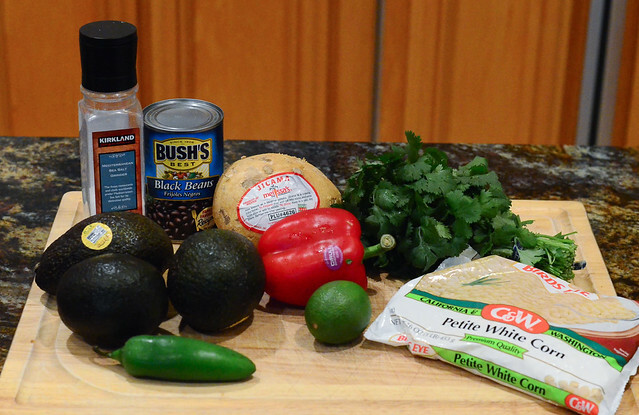 The grocery list – Salt, a can of black beans, jicama, cilantro, 3 avocados, red bell pepper, jalapeno, lime, and frozen white corn. This will make a good amount and you can easily scale it down if you have less of a crowd to feed. 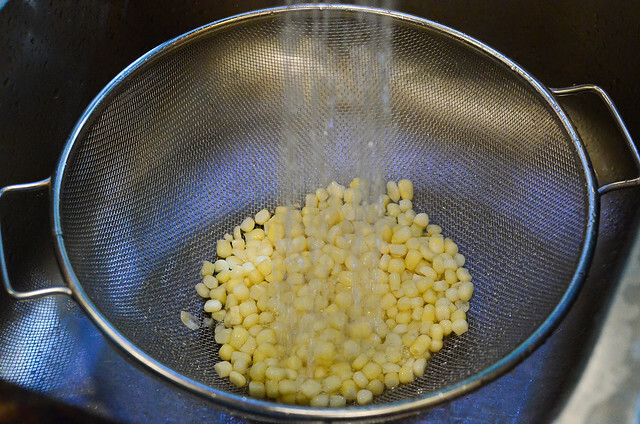 Rinse one cup of frozen corn with cold water for a couple of minutes until it has thawed. Drain it well and then rinse and drain the black beans as well. Fresh corn would be wonderful in this so if you can get your hands on some ears of corn and have a little extra time for the prep, by all means go for it. Check out this post for directions on grilling the corn. Using frozen corn makes this super simple to put together and I promise it will be wonderful. The easiest way to chop an avocado is to do it while it is still inside the skin. Cut the avocado in half and remove the pit, but don’t throw it away (we’ll talk more about the pit a little later). 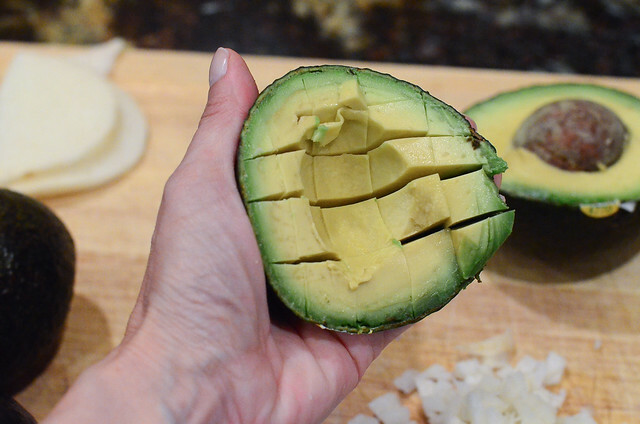 Using a sharp knife, carefully slice into the avocado just up to the skin, in a criss-cross pattern. Then run the knife along the outer edge of the entire avocado, just inside the skin and scoop the chopped avocado into a mixing bowl. Everything else goes in. 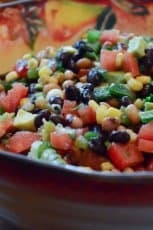 The rinsed and drained corn, black beans, diced red bell pepper, diced jicama, diced jalapeno, chopped cilantro, a touch of salt, and the juice from a lime. The California Pizza Kitchen version of this guacamole has a chopped consistency, versus the smashed consistency you typically see. If you toss the mixture lightly it will (mostly) hold it’s chopped form. A little smoosh is okay. Here is an interesting little tip. 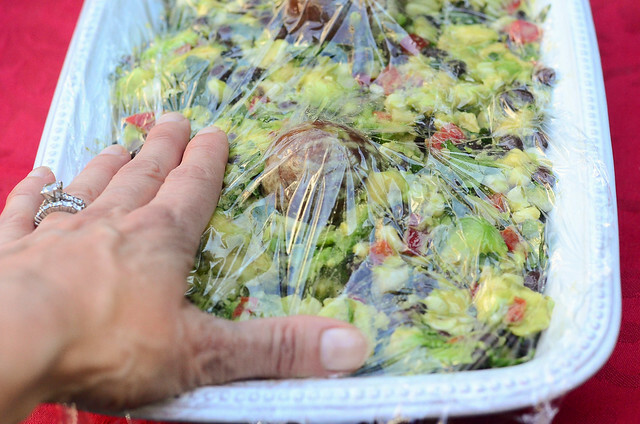 If you don’t plan to serve it immediately, press a couple of those avocado pits that you saved in the previous step into the mixture and then cover it with plastic wrap, pressing the wrap right down on to the guacamole. This will ensure that less air hits the surface and will help prevent it from browning the way that avocados tend to do. I don’t remember where I learned this but I swear by it. It works! A little bit of everything and tons of flavor in each bite. 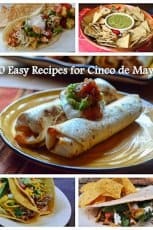 I never would have thought to add so many thing to it – I love the idea of a little corn in there, will have to give it a try! What a perfect name for this dish!!! So much more than a guacamole. I’d be eating this with a fork. Looks delicious! So scrumptious! 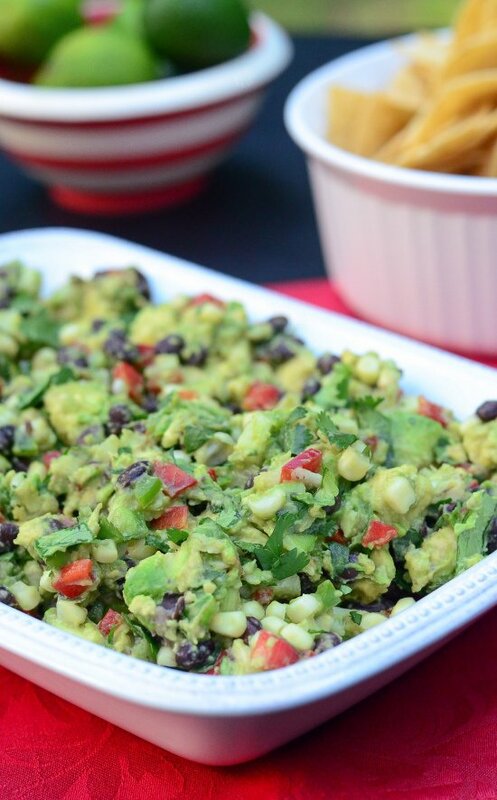 Love your delicious spin on guacamole. This is a killer recipe, Valerie! It would be a HUGE hit at my neighborhood parties. Thanks for sharing! Making your own is a lot better than from the stores or restaurants. You know the quality of ingredients you put in it and you control the flavor. And the most important thing is you get a lot more! 🙂 That is one hearty and beautiful guacamole, Valerie! Even though it’s not traditional, I love every ingredient you put in here so I would love this guac! 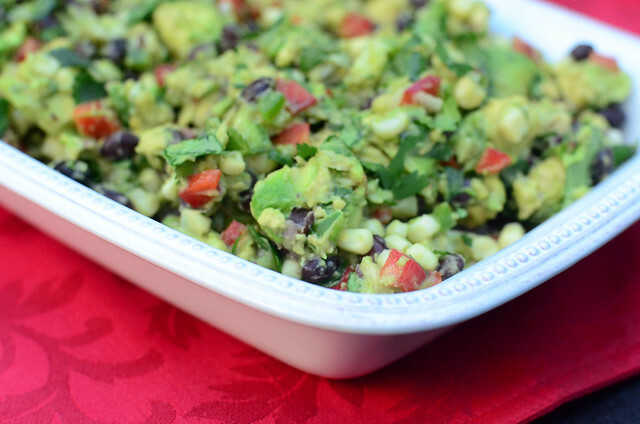 Love guacamole that is loaded with veggies! I’ll have to try this soon! Thanks for the GREAT guacamole recipe and the pressing down the plastic wrap tip. 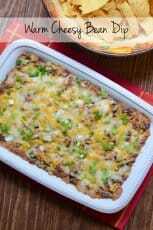 I put pit to prevent, but never press it down – missing the crucial step! I was at the CPK the other day and ordered the salad from small plates – I wasn’t paying attention the guacamole recipe. But we love guacamole and sounds like it won’t be enough for the family. This recipe is wonderful, Valerie! Could you Please Tell me What Jicama is? and is it in the Produce area of the store? ?